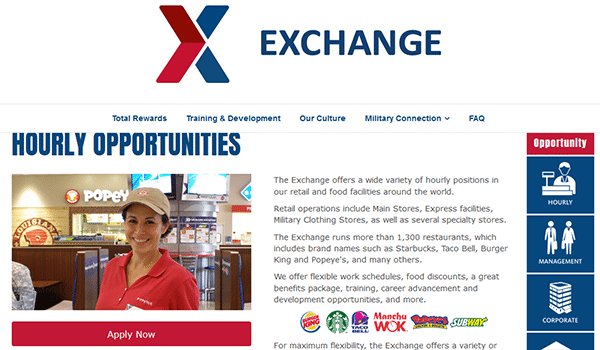 The online AAFES job application is available via the company’s careers page (scroll down to learn how to use the careers page/site). 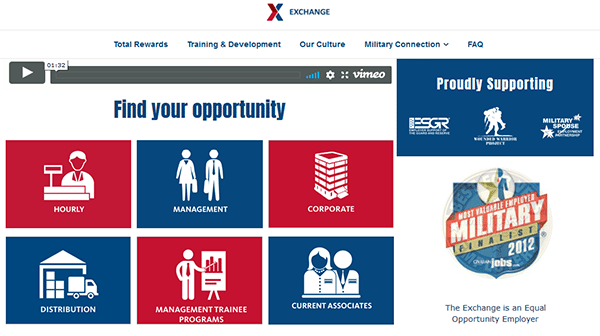 Follow the links posted on this page (near the top of the page/in the instructional guide) to go to the AAFES employment page. When you open the company’s employment portal you will be able to search for current job openings, register for an online account, and fill out/submit applications for any job openings that you want to apply for. About the Organization: AAFES (Army and Air Force Exchange Service) is a department store/retail chain that is only located within U.S. Army/Air Force installations. There are more than 2,700 locations throughout the world. AAFES employs more than 30,000 people. Step 1 – Click here to have the AAFES employment page load in a separate internet tab/window (in your current web browser). Step 2 – Scroll down the page and click the button of the career type that you’re interested in. Note: This guide shows how to search/apply for retail positions. Other career types may have different application processes. Step 3 – Click the red button as shown in the below screenshot (to go to the next part of the job search process). Step 4 – Enter a keyword into the first search field and then enter a location into the second one. Click the search button to load the list of openings. Step 5 – Use the options on the left side of the page to filter through the results. Click the title/link of the job that you’re interested in applying for to go to its description/summary page. Step 6 – Review the job description, and then click the button outlined in red below (at the bottom of the description page). Step 7 – Log in to your account, or click the “Don’t have one yet?” link to go to the registration page. After you’ve created/logged in to an account you will be able to start filling the application form.